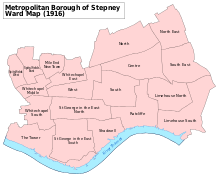 A map showing the Mile End New Town ward of Stepney Metropolitan Borough as it appeared in 1916. Mile End New Town is a former district in what is now Whitechapel, Bethnal Green and Shoreditch, Greater London, England. It was once a hamlet and today its name is little used. 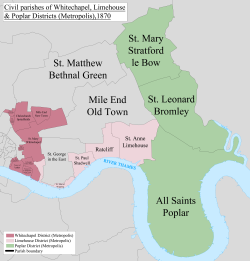 Following a period of rapid growth it became a hamlet within the large ancient parish of Stepney from 1690, and was split off as a separate ecclesiastical parish in 1841 and civil parish in 1866. It used to border with Bethnal Green to the north, Whitechapel to the east and south, and Spitalfields to the west. Old Montague Street formed much of the modern southern boundary; the northern and eastern boundary approximating the East London Line cutting; and the western boundary falling short of Spital Street. Mile End Old Town (today known as Mile End) was located some distance to the east, separated from Mile End New Town by Whitechapel and Stepney. It was grouped into the Whitechapel District in 1855 and became part of the Metropolitan Borough of Stepney in 1900. The parish was abolished in 1921. This page was last edited on 19 October 2018, at 14:29 (UTC).